Kaitlyn Sheehan felt like the kid picked last for the team. Her pitch for help to develop her idea of an app aimed at patients with cardiac stents went unanswered on the first day of the recent Windsor-Detroit Hacking Health event in Detroit. “I went home that Friday night and thought about just going to watch my son’s travel hockey tryouts Saturday,” said Sheehan, a registered nurse who splits her time in the cardiac catheter labs at Windsor Regional Hospital (Ouellette campus) and Detroit’s Harper Hospital. In the next two days, Sheehan’s idea went from unwanted to unmatched. 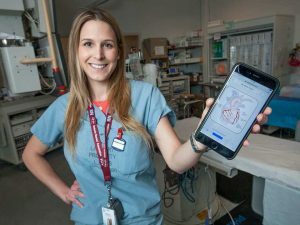 Her app called Stent Tracker was named the Judges’ Overall Favourite and took the award for the Highest Potential For Adoption. 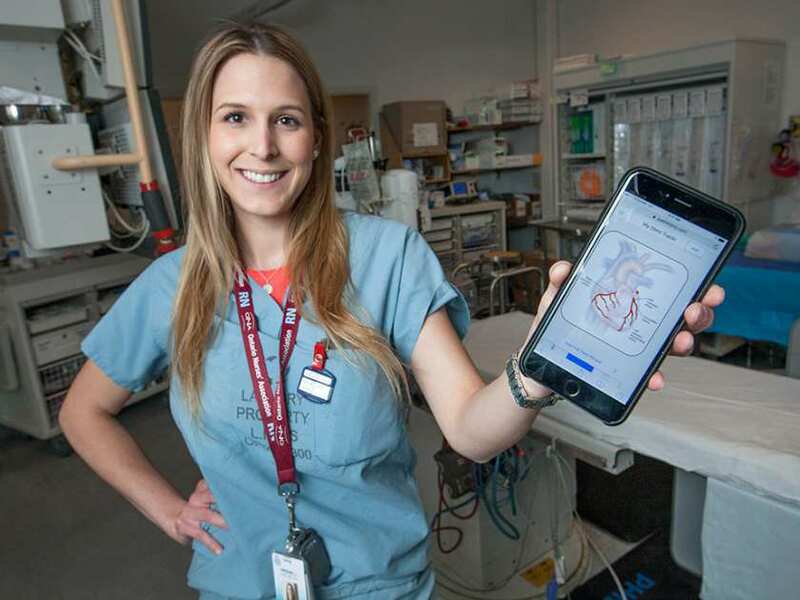 The web-based app allows patients to store their cardiac stent information, manage their medication list, schedule reminders when to take their meds and provides education on heart health and coronary angioplasty. With the win, she got an invitation to the eHealth Conference in Toronto worth $2,800 and six months of commercialization support from WEtech Alliance and the Downtown Windsor Business Accelerator. “Right now, patients have to carry cards around with their stent information to give to health-care providers,” the 24-year-old Sheehan said. “People forget or lose them. If you have multiple stents, you may need more than one card. Part of the solution was not giving up on her idea after the initial rejection. Her persistence was rewarded when London-based physician Dr. Ketan Patel, two medical students and two computer programmers from Next Healthcare Technologies — a spinoff from the Windsor-based IT company Next Dimension — joined her team. The next step is the commercialization of the app. Sheehan hopes to make some connections at the Toronto conference and build on the relationships she’s already established. She intends to start her own company to launch the product with the help of the business consulting help she’ll receive. Sheehan said her experience at the event was invaluable for someone with an entrepreneurial mind. Having a foot on either side of the border in health care, Sheehan said the event also opened her eyes to the possible opportunities of creating a cross-border medical hub in the area. “I think the most important thing I learned is you can create something right here because of all the talented people in the area,” Sheehan said.